Discerning between real and fake news has become an increasingly difficult task, especially in the digital domain. With a goal of helping students address this challenge, UNC Charlotte — with faculty from the College of Liberal Arts & Sciences as leaders — was selected as one of 10 institutions for the pilot program “Digital Polarization: Promoting Online Civic Literary,” sponsored by the American Association of State Colleges and Universities’ (AASCU) American Democracy Project. 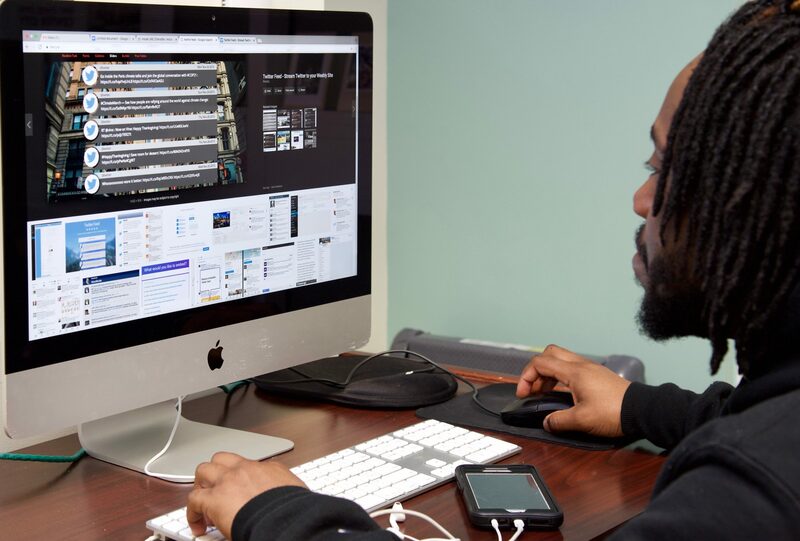 Faculty from the University Writing Program (First Year Writing), the Department of Communication Studies and Atkins Library comprise a team developing the University’s pilot aimed at better preparing college students to navigate the online news environment. Stephanie Otis, associate dean for public services, Atkins Library, is facilitating the team’s efforts at engaging students to build civic, information and web literacy. The University’s “Digital Polarization: Promoting Online Civic Literary” project pilot team members are Jason Black, professor and chair, Communication Studies; Min Jiang, associate professor, Communication Studies; Mary Ellen Muesing, lecturer, University Writing Program; Debarati Dutta, senior lecturer, University Writing Program; Ryan Harris, head of research and instructional services, Atkins Library; and Catherine Tingelstad, instruction and curriculum engagement coordinator, Atkins Library. The AASCU will provide guidance and training on specific techniques to impart to students. A recent training workshop at the AASCU Academic Affairs Winter Meeting introduced participants to Mike Caulfield’s “Four Moves,” along with other strategies related to the initiative. The “Four Moves” are to check for previous work by an author; go upstream to the source by searching for the original instance of the content; read laterally across other trustworthy sites; and circle back to use what was discovered to begin a better search, if necessary. Otis explained that in order to reach the broadest number of UNC Charlotte students, the team is exploring integrating the concepts and techniques of the project in their own courses, which already deal with issues of inquiry, critical reading, digital literacy practices, communication ethics and civil discourse. From there, the team will explore ways to collaborate across campus to share successes and strategies for others to build upon. Members of the UNC Charlotte community who are interested in this pilot project should email Otis at sotis@uncc.edu.